This post published at 8:45am on Saturday, September 22, 2018, one year to the minute before Ireland's opening match in the 2019 Rugby World Cup against Scotland. 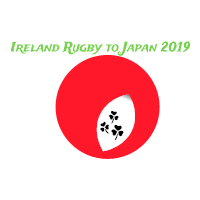 "Paddy To Rugby World Cup Japan 2019" is a new blog set up and run by by Fergus Moloney to create an online space for Japan-bound Irish rugby fans to share plans and experiences both before and during what promises to be an amazing journey. So without any further ado, here is a post from the man himself explaining the site more...be sure to bookmark it and get involved!!! Seriously though, I am starting to get excited all ready. But I need to focus on the planning. I have the Japan Rail Pass, but more hotels or other accommodation needs to booked. Also suss out the best places to eat-- and drink! I have come across some handy tips and advise on other travel blogs and websites. I will pass these on to you later. I really started this blog so that travelling Irish fans could help each other out and maybe hookup for a drink or two while we are over there. I have never toured to a major overseas sports event before, so I do not know how we all manage to find the same places to hang out. Any tips from experienced travelling fans appreciated. I will pass links to various online sources of information on, rather than reproduce all the info here. Hope to post lots of photos and funny stories. Oh yes, -- and 'COME ON IRELAND!